Somehow, Stephon Marbury has made it back into the light. And he’s shining now. Brighter than he ever did in the NBA, at Madison Square Garden, or even in his hometown Coney Island, Brooklyn. 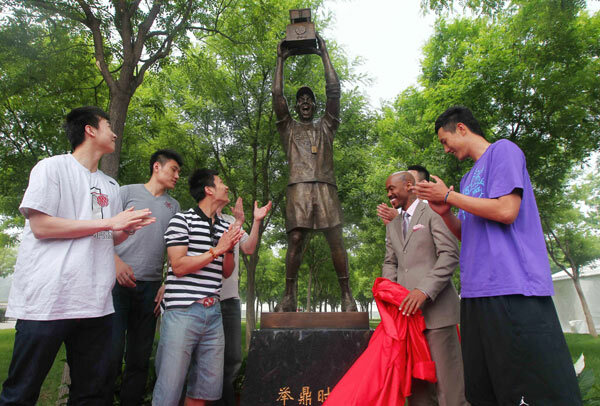 The man has his own statue in front of Wukesong arena in Beijing now, where he won his first championship as a pro. Last night, HBO Real Sports finally aired its Marbury story, and more so than a statue could ever be, this feature was Marbury’s cataloged redemption. Hit him on the fall out with the Knicks, the failed Starbury shoe brand, those bizarre YouTube videos, and Marbury addresses it all without shame. He talks about it with the measured distance of understanding. He bares it all: depression and suicidal thoughts. It’s a past he acknowledges, even embraces, because without that rock bottom, he would never have found China. But the past is the past. Marbury has moved on. He still can’t quite speak the language, though he is learning. He has even started calling some plays in Chinese–which his teammates love. Marbury says he wants to stay in China forever, and you get the sense that this isn’t effusive exaggeration. He dreams about someday coaching the Chinese national team in The Olympics. That’s the biggest difference between Marbury and the dozens of other NBA outcasts relegated to China, his investment in the country itself. Other guys are there to collect a paycheck, and maybe try to get back into the NBA, but not him. The Houston Rockets called in 2011. He turned them down. In China, they watch Stephon Marbury like he’s a national hero, and he seems all about living up to that idea. To have seen Marbury’s dreams of China described in 2011 by GQ’s Wells Tower as: “the vastest, most ornately bespired cathedral of ambition I’d ever met anyone trying to build,” and now to see those dreams actually coming true is indeed an incredible story of redemption. This is some ludicrous extended version of Mr. Baseball. I call the CBA a bizarro NBA. It’s an alternate reality where Michael Beasley goes to score 59 points in an All-Star Game, and where Metta World Peace goes to reassign himself the “Panda’s Friend.” Stephon Marbury is finally beloved in China the way he never could be in the U.S. He has made this alternate reality his own, and China his unlikely kingdom. Below is a link to supplementary web content from the HBO Real Sports website. You can watch the full episode on HBO Go.